Age at maturity shift is real. Have an idea for interlocking concrete 'Reef Pavers' or 'Coral Blocks' if any readers are in that business. Have Sea Bass Trips Scheduled Through The End Of June – Reservations Being Accepted. Have opened July & August to "Whatever's Biting On The Reef Trips" - Think Flounder! Sailing Daily For Sea Bass. Saturday's 6:00 to 3:30 - $125.00 – Otherwise 7 to 3 at $110.00..
9,346 "Oyster Castle" reef blocks by the rail – 2,644 at Jimmy's Reef – 1,938 at Ake's – 456 at Lindsey Power's – 342 at Patrick's Eagle Scout Reef. The Reef Foundation deployed a bargeload of concrete pipe at Research Reef last week – Sis & Pete's Reef is begun. Please Sponsor Reef Building At ocreefs.org – Thank You! Our sea bass season opened May 19th with a cod. Very first fish over the rail at what I thought was a great sea bass spot for our "Hunger Games" opener – a cod. We're seeing 3 a week, sometimes 3 a day. We're also seeing ling (red hake). Like cod, its not everyday, but sometimes everyone will have a fish-fry's worth. Trust me, we're catching sea bass. That's the target. It's just that occasionally we see other species too – cold water species. Exercising his ability to catch fluke where there are none, Flounder George pulled the first 'on purpose' summer flounder over the rail despite scuba reports of no fluke in the area. Looking forward to many more; I hope to be offering fluke/sea bass trips by late June/early July. The sea bass catching is well-expressed by Hurricane Murray's recent run of luck: He won the pool Friday, was high-hook Saturday with twelve fat cbass & had his head handed to him Sunday by an eleven year-old. Boy, did we have fun with that..
Quite a few anglers on my boat are catching Massachusetts, Connecticut & New York limits of 8 sea bass, but w/o their abundant scup. Virtually everyone's catching a Rhode Island 3 fish limit. A few NJ/DE/MD/VA 15 sea bass limits have come our way too. We've been sending everyone home with dinner – except Murray on Sunday. The youngster & his Dad could have invited lots of friends over for a fish fry. Cod & ling are cold-water fish. We are not catching red snapper. I had spots devoid of sea bass even in mid/late May because, I believe, the bottom temp was still too cold. When managers meet this week at the MAFMC meeting in Freehold, NJ, you can bet a case will be made for sea bass populations moving north; for sea bass populations leaving the lower Mid-Atlantic & moving into nearshore waters of southern New England; for ghostly statistical catch-conjectures of Grady-White and Boston Whaler skippers doing fantastically well in state waters of NJ, NY & Massachusetts, for their catches to have trumped all the skill and multi-generational fishing knowledge of the recreational for-hire & commercial skippers, these most-skilled captains limping along within the confines of drastically reduced sea bass quota while private boats are statistically estimated to have burst through every regulatory ceiling created. MRIP private boat catch estimates that demonstrate New York's For-Hire boats caught just 5% of that state's summer sea bass and, more incredibly still, New Jersey's party/charter guys catching only 3% of their state's sea bass are wildly inaccurate. Pulling science & management into MRIP's backed-up septic system, those very estimates draw us deeper into regulation's stink. MRIP catch estimates create enormous illusions of recreational over-quota landings from the private boat fleet; their highest catches ever are juxtaposed, seemingly without a care, against party/charter's lowest sea bass landings ever. I recently spoke with a Montauk charter skipper who was positively dumbfounded when I told him NY's private boats alone, not party/charter, were the source of recreational overfishing. You truly have to have no idea of the fishery to accept recreational sea bass estimates so favoring the private boat sector. Designed to arrest over-quota situations; Accountability Measures (where we have to 'pay back' over-quota catches) threaten many recreational fisheries but sea bass in the Mid-Atlantic especially. We're one bad estimate away from complete closure. If Rhode Island private boats are said to have caught more sea bass in May/June than every recreational estimate in history combined; That's what we'll have to pay back in "Accountability Measures." Strikes me management's use of statistics is what needs accountability. . . The Athenians held justice was only a concern between states of equal power. In all other instances the strong do what they will and the weak suffer what they must. For now NOAA/NMFS's wielding of MRIP's illusions is as the Athenian's once exercised their navy. MRIP's delusional catch-estimate tables are stronger than any true representation of the sea bass fishery. I believe recreational party/charter will soon have lost the sea bass fishery. Maybe we already have and it just hasn't played out down here yet. Indeed, MRIP claims that in two summer months of 2013, NY & NJ private boats outfished the whole year's party/charter landings AND average commercial catch combined along the entire east coast.. 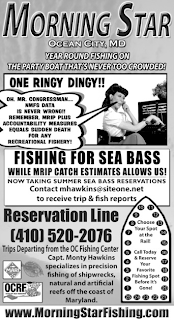 When re-opening January/February sea bass for party/charter is discussed this week, the fact that 100% of our accused quota overage comes from MRIP's illusionary private boat catch may not even enter the discussion..
We should have a 20 or 30 fish sea bass limit in January & February.. It'll take a lot of heat off tautog and keep guys off unemployment while having virtually no impact on recreational quota because real & measurable catch is low. Our trouble comes from MRIP's statistical WAG's, not real landings. I've seen restored sea bass abundance with my own eyes, many clients have experienced it. It's a picture seen quite clearly in science's sea bass abundance graphs and in hard landings reports from commercial & recreational for-hire, even MuRFSS picked it up. Sea bass populations on every reef shot skyward when the size limit was smaller. Their number grew exponentially in early management even without a bag limit. When there were many more recreational participants the sea bass population blossomed. Since the size limit hit 12 inches & a bag limit was begun, our region's sea bass population, and our region's population of sea bass fishers, has only declined.. It believe it's a very simple thing to leave sea bass fishing incredibly better than we found it. To see just how simple, first we must eradicate catch estimate's fakery from management's perception, from their regulatory considerations: When we create a true picture of population response from reported catch and allow no input from statistical guesswork, a path of fishery management not currently seen will be made plain. This simple formula: "Make sea bass spawn young and give them lots of habitat" can take their population higher than ever before – Ever. Presently we're on course to make their numbers fewer than ever before. In 1977 a scientist wrote - "all sea bass over 10 inches are male..."
Since 2002 almost no 10 inch sea bass are male. They're almost all immature females we now call "shorts." Spawning production is minimized as a result of recreational size limit. Previous Fantastic Success Is Real: Creating Exponential Population Growth With No Bag & An Under-12 Inch Size Limit Is Real. Population decline since 2003 is real. 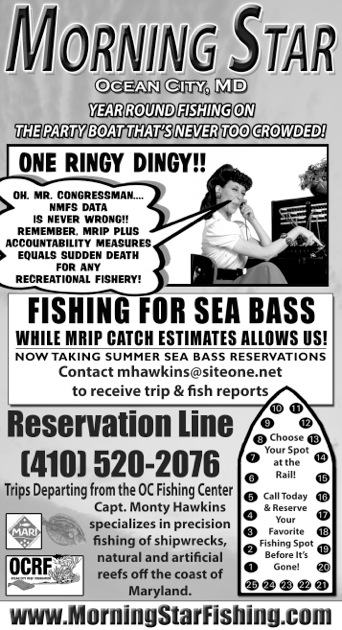 Below is my recent ad from Coastal Fisherman that touches on MRIP. Sorry if you don't remember Lily Tomlin in Laugh-In.